On the pleasant fall evening of September 17, acclaimed journalist Pete Hamill led a notable cast of performers celebrating America’s labor movement at a special event in The Cooper Union’s Great Hall. This was the third in an eight-part series celebrating the Great Hall’s 150th year as an historic site for major political and cultural events. Since 1859, the Great Hall has been a preeminent stage for pioneering individuals whose views reshaped society, from Frederick Douglass and Victoria Woodhull to W.E.B. DuBois. Each of the eight programs in the “Great Evenings in the Great Hall” series focuses on one area of civic responsibility, reform or education. For the September 17 event, Worker’s Rights were at issue. The program explored America’s labor movement as seen through the eyes of its most ardent advocates, all of whom spoke in the Great Hall: Clara Lemlich, Samuel Gompers, Eugene V. Debs and Mother Jones. 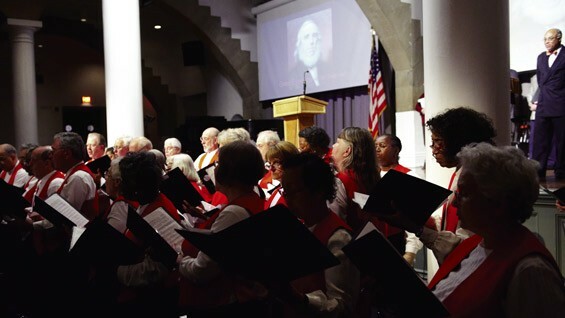 Historic photographs and documents complemented the powerful words that advanced a movement and the stirring voices of the New York City Labor Chorus recreated the songs that signaled the changing times.